The Layoff Diaries: Nice girls finish last? When I pick up my daughters at the end of the day, it’s not the typical “grab backpacks and firmly herd them out the door” kind of scene. Because Joe is the family cook – and he won’t be home until after Neve’s pre-school closes at 6, anyway – it frankly makes no difference to me whether the girls want to linger and play with their friends or leave right away. So on most days, I take a seat and play with them, or chat with the young women who are their caregivers, or just spectate. While doing the latter on a recent evening, Neve and a friend were playing with a plastic toy garage, with curving car ramps, when a younger blond girl approached the table and pulled it toward herself. Neve yelled, “Hey!” and yanked it back, like a reflex. I’m a lifelong skeptic, so I have great difficulty explaining why, on a fairly consistent basis, I stumble upon things in my reading life that address, in an uncanny way, something I’m experiencing right at that very moment. When it’s their time to go? They all were made before. And made to work like new. I’ll confess, I struggled mightily to keep myself from sobbing as Lily read these words aloud. My father-in-law had long been suffering from a rare form of skin cancer, so these images of renewal and release and rebirth worked like a salve on an awful night. The chapter where Joe had left off reading, “The Rabbit Sends in a Little Bill,” tells what happens when the White Rabbit mistakes Alice for his housemaid; as she tries to carry out his wishes, she takes a swig from a bottle marked “DRINK ME” and grows so big that Rabbit’s house can barely contain her. You and me both, Alice. For although I may not have bumped into you on my way down the rabbit-hole, we’re both clearly taking up semi-permanent residency in Wonderland, with all the delights and horrors contained therein. Indeed, that’s what this strange, surreal post-layoff time ultimately boils down to. There’s sheer terror and worry underlying each day; but there’s also a palpable spark of hope for new adventures, too. You feel more alive than you do before, but at the expense of – well, being able to take care of expenses. 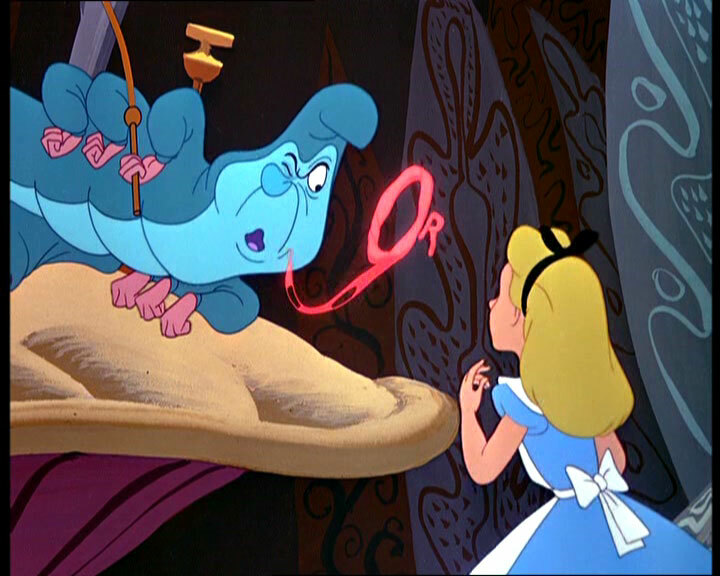 Unlike the days and years that came before, you just have absolutely no idea what’s coming up ahead (looking at you, trippy hookah-smoking caterpillar). And depending on your mood on a given day, that notion will make you either jump up out of bed or burrow ever deeper under the down comforter. The line was kind of funny, in a gallows humor way; but this wasn’t just a joke, and I wasn’t speaking hypothetically. After receiving a late-in-the-day Tuesday email – containing three clues that blinked like a neon sign, pointing to my imminent layoff – I’d stayed up late, uploading the hundreds of videos and photos (mostly of my daughters) from my work-issued phone, and sending documents and contacts I wanted to keep from my laptop. It was like living out that “If you were stranded on a desert island” scenario, but with your two most essential gadgets. We tried to hold to our usual morning routine on Wednesday, getting Lily to the bus stop, and dropping Neve off at preschool; but then I stepped back into our quiet, empty house, left to twiddle my thumbs until nearly noon. I’d thought a bit about this the night before, while frantically uploading, and I’d decided that this would be the perfect window of time to finish up my year-end wrap-up of local theater highlights and news. I was off the clock, and year-end pieces like this had recently gone the way of the dodo, but I’d wanted to do it, anyway.